Christ University school of law was founded in 1969. It offers academic courses in law at both undergraduate and postgraduate level. This article will focus on the two undergraduate law courses offered by Christ University which is an international educational institution.These two undergraduate law courses are BA.LLB and BBA.LLB. 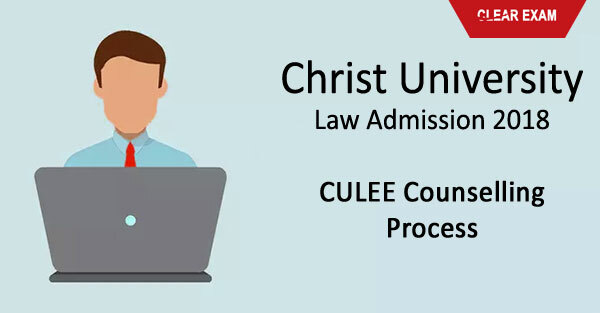 The Christ University Law Entrance exam is also popularly known as the CULEE Exam and it will be held on April 24, 2018. The selection process takes place in 4 stages. The first is the Written law entrance Exam, second is the Skill assessment and writing assessment round, third is the micro presentation and last is the GD-PI ( group discussion and personal interview). Except for the law entrance test all other rounds will take place at the time of CULEE Counseling Process 2018. Students who score marks equal to or more than the cut off in the Christ University law entrance examination will be called for the skill assessment round during CULEE Counseling 2018. Selected students who have cleared the entrance exam will also have to appear for micro presentation, group discussion and personal interview again at the time of School of law Christ University Counseling. The skill assessment round where your ability to present yourself and your ability to write well are judged. The micro presentation where a topic related to business will be given and one has to prepare an extempore on the same. Group discussion, and personal interview where again your verbal skills, your personality are analyzed. The results of last 3 rounds will be announced within 72 hours of the rounds taking place. The next step in counseling is that your academic performance in grade XI,XI and XII would be judged as against the academic performance of other applicants of the exam. The CULEE counseling 2018 will take place offline between April 24- April 28, 2018 and the selected students have to be present at the venue of counseling on the date and time assigned along with original documents, and photocopy of the documents. Without the documents the student will be deemed ineligible for admission. Once the documents are verified then the final results will be announced by May 5, 2018. The selected students who wish to take admission have to pay the CULEE counseling fee. After fee payment, the candidates will be allotted the University ID card, a smart card and South Indian Bank ATM card. CULEE Seat Allotment will take place in accordance with the following factors which are the documents being verified, the total number of seats being available which is 300, and rules regarding reservation of seats. The college follows the same rules of reservation that have been notified by the Union ministry of human resource development, Government of India.These rules say that 15% seats are reserved for Scheduled Caste, 7.5 % for Scheduled Tribes, 3% seats for differently abled, and plus seats for NRI students. Counseling is the last step and then the admissions are final. Getting into School of Law, Christ University is a matter of pride. It has been ranked among top ten law colleges in the country based on its resources of teaching, and learning, impetus given to research in the college, how much is the reach of the college and whether it gives admission to international, and foreign students, how inclusive is the college’s admission process and whether it gives a chance to backward classes, how the placements are and last of all how people perceive the college. CULEE Exam is going to be conducted in the month of April 2018. CULEE Counseling is considered as one of the most crucial step in the selection. Go through the post to know about the CULEE Counseling Process.